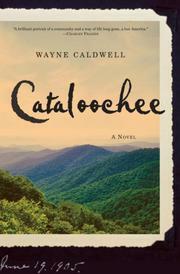 One hundred years in Appalachia are detailed in a lovely and gently captivating first novel from North Carolina native Caldwell. North Carolina’s Cataloochee Valley saw its first farms and homesteads in the 1830s. The United States government took possession of this land when it created the Great Smoky Mountains National Park in the 1930s. Caldwell traces the 100-year history of this small, isolated settlement. The pleasantly meandering narrative follows the descendents of James (Old Jimmie) Carter as they grow up, fall in love, tend their crops, mourn their dead and, finally, contend with the loss of their land. The novel’s dramatic climax is a murder trial, but Caldwell renders the day-to-day existence of his characters with such exquisite sensibility that homicide and courtroom spectacle are hardly more interesting than a woman’s determination to order a sewing machine from the Sears catalog. There is violence in the book—this is a heavily armed community, and it’s well-stocked with liquor—and many of these characters are one disaster away from poverty, but there’s none of the squalor and horror of many Southern Gothic novels. Caldwell resists the pull of nostalgia and romance, too, and he refuses to turn his characters into colorful, country-fried caricatures. They do speak in dialect, but it’s not a gimmick, and Caldwell’s narration is a beautifully modulated echo of their bluntly musical locution. The author also gives his characters plenty of room to amble and grow, and they become the kind of people the reader misses when the last page is turned. A wonderful novel, and a first-rate debut.